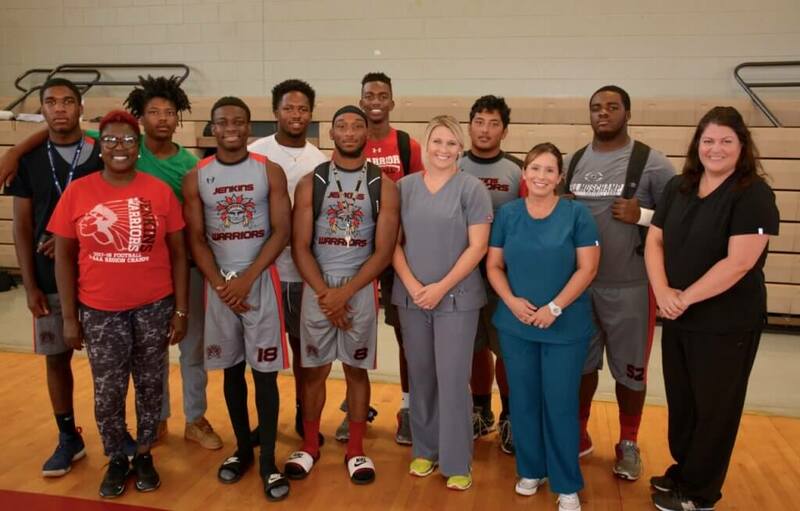 Dr. Angela Canfield fits the football players of Jenkins High School and Savannah Christian Preparatory School for custom mouth guards. Tommy Linstroth, founder of Sustainativity, presents a check of over $5,000.00 to Julie Wade, Executive Director of Park Place Outreach, for energy efficient appliances for the shelter. 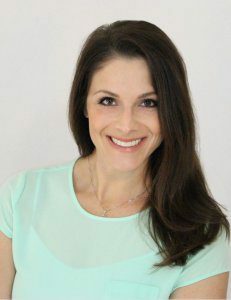 (SAVANNH,GA) Kate Doran, owner of Savannah Power Yoga and SPRY Mind & Body is coordinating the third annual Yoga Relay and silent auction benefiting the Edel Caregiver Institute, a program of not-for-profit Hospice Savannah, Inc. The Yoga Relay is on Friday, August 24, at Service Brewing Company. Individuals or teams may sign up for the Yoga Relay of one hundred sun salutations at www.SavannahPowerYoga.com/workshops, or call 912.349.2756. Registration is $30 and includes one drink ticket at the brewery and a swag bag. 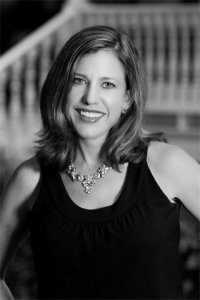 Yoga begins promptly at 6:00 p.m. and the silent auction closes at 8:30 p.m.
(SAVANNAH, GA) The Lowcountry Down Syndrome Society (LDSS) has hired its first executive director. 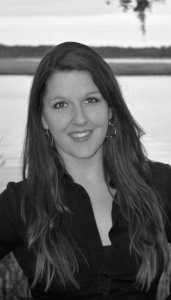 Kayla Johnson will be responsible for administering the growing organization’s activities and annual events, including the one-mile Buddy Walk, the Night of Champions gala dinner and Camp Buddy. For more information, visit http://www.ldssga.org/. 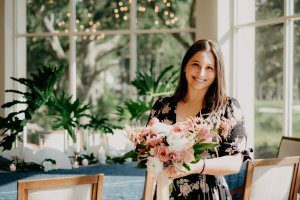 (BEAUFORT COUNTY, SC) With over thirty years of combined experience in event planning and floral design, Dakotah Terrace and Terry Simmons have launched a new Event Design company, Jardiniére. Headquartered at 61 Arrow Road, STE. E, Hilton Head Island, SC 29928, Jardiniére’s facility features a consultation showroom, reception, office and studio workroom. The company offers services in Hilton Head Island, Bluffton, Beaufort, Mt. Pleasant and Charleston areas, as well as the greater Savannah area. Distinguishing themselves from planners and coordinators, Jardiniére owners affirm that they create one-of-a-kind experiences for clients by achieving the desired decor looks through typography, linens, rentals and florals. For more information, visit www.jardiniereevents.com. The company is also on Facebook at https://www.facebook.com/jardiniereevents/ and on Instagram at https://www.instagram.com/jardiniere_events/. (SAVANNAH, GA) Got an idea for a unique exciting new product or service? Then consider the new “BizPitch Savannah” entrepreneurial competition, a kinder, gentler version of TV’s “Shark Tank.” It’s a chance to pitch your idea to a panel of judges with the potential to win $2500 in cash and a package of professional start-up business services worth an estimated $7,500. Must apply before Aug 1, 2018. Competition rules and application forms are available at http://bizpitchsavannah.com. (SAVANNAH, GA) Football teams from Jenkins High School and Savannah Christian Preparatory School received free custom mouth guards courtesy of the 2018 Canfield Mouth Shield Program sponsored by Dr. Angela Canfield of Sandfly Family Dental in Savannah and Premier Dental Designs in Rincon. This was the fifth year Canfield has donated mouth guards to local schools. These custom-made mouth guards provide stability to the players’ jaws and cushion blows that can cause severe dental injuries such as broken teeth, fractured jaws, gum lacerations and injuries to their lips or tongue. 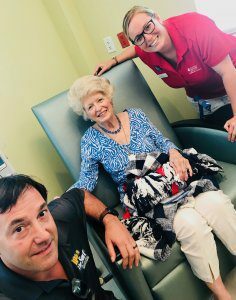 Savannah Christian has three football teams that benefited from the donation: a fifth- and sixth-grade team, a seventh- and eighth-grade team and a high school team. “We are excited to use this gift as a chance to educate our players on safety fundamentals,” said Eddie Wilson, a school board member and volunteer head coach for the SCPS fifth- and sixth-grade team. Jenkins High School is the first Savannah public school to win consecutive regional football titles during the 2016-2017 and 2017-2018 seasons. Canfield’s donation will allow the team to put more of its booster club’s fundraising capacities toward providing pre- and post-game meals for its players. The full fitting, molding and examination of each player’s mouth guards usually costs $440. Between Jenkins and SCPS, 177 players will benefit from this donation, which amounts to $51,480 of donated protection pieces. These mouth guards have a one-year warranty that covers dental expenses incurred by players who are injured while wearing the mouth guards. The warranty also pays $1,093.75 per injured or replaced tooth and up to a maximum total liability of $35,000 per incident. 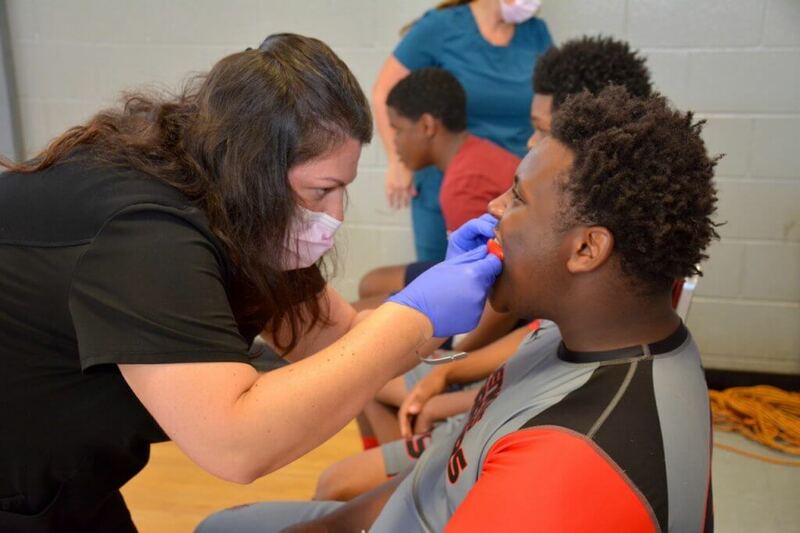 Jenkins High School football team gets fitted for custom mouth guards by Dr. Angela Canfield of Sandfly Family Dental and Premier Dental Designs. (SAVANNAH, GA) Lowell Kronowitz, president and fourth-generation family owner of Levy Jewelers, has been named president of the Rotary Club of Savannah. Kronowitz will be joined on the Rotary board of directors by secretary/treasurer Diana Morrison, sergeant-at-arms Roger Moss, along with Louisa Abbot, Todd Groce, Cecilia Russo Turner, Rick Belford, Jamie McCurry, Swann Seiler, Ellen Bolch, Trip Tollison, Dale Critz Jr., David Rosenblum and Marjorie Young. 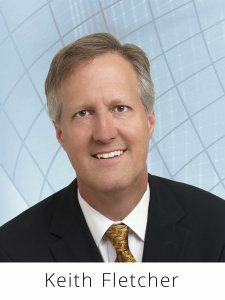 In addition to his new position, Kronowitz currently serves as chairman of the 200 Club. He is a member of both the Bethesda Foundation Board and a past treasure of the Bethesda Union Society. His previous positions include serving as the Rotary Club’s secretary/treasurer and membership on the Telfair Museum and United Way boards. 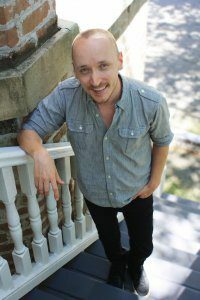 Kronowitz attended Savannah Country Day and Gould Academy, then received his bachelor’s degree from Hobart College and attended the University of Michigan for an MBA. He returned to Savannah to assume leadership of Levy Jewelers and has remained here with his wife, Hilary, and three children. The Rotary Club of Savannah includes 225 community leaders and volunteers. 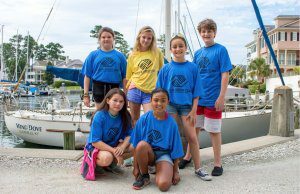 Over the past 103 years, the club has championed local and regional developments that include completing the road to Tybee Island, improving the Savannah River for commercial traffic, enhancing the Dixie Highway system in southeast Georgia and building bridges over the Savannah and Altamaha Rivers. Most recently in recognition of its 100th anniversary, the club raised funds and built an all-accessible playground in Forsyth Park. The club also sponsored the organization of new Rotary clubs in Augusta, Brunswick, Statesboro, Blackshear and Savannah West. Furthering the goals of Rotary International, the club has supported wartime relief efforts, student scholarships, polio eradication and other global health initiatives. 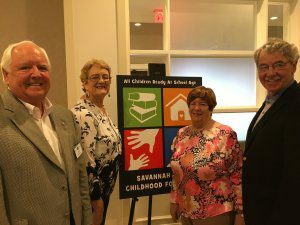 (SAVANNAH, GA) The Rotary Club of Skidaway Island and the Kiwanis Club of Skidaway hosted “A Nashville Night,” benefiting the Savannah Early Childhood Foundation (SECF) on Wednesday, July 18. 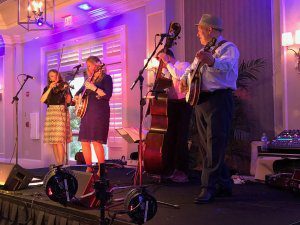 The fundraiser featured the Michael and Jennifer McLain Bluegrass Band and a live auction to benefit the SECF. Over 200 tickets were sold, and in combination with items auctioned, the event raised $10,886 for the SECF throughout the evening. The SECF is dedicated to providing parents of children younger than five years of-age with the resources and support they need to cultivate stimulating and quality learning environments in the home. According to SECF President Paul Fisher, the money raised will be matched by gift from Donald and Sandy Mayer. The funds will be used to expand reach and impact of the SECF by creating new modules for learning and implementing programs to reach more parents including a new male/father specific module. Helping the children of Savannah. 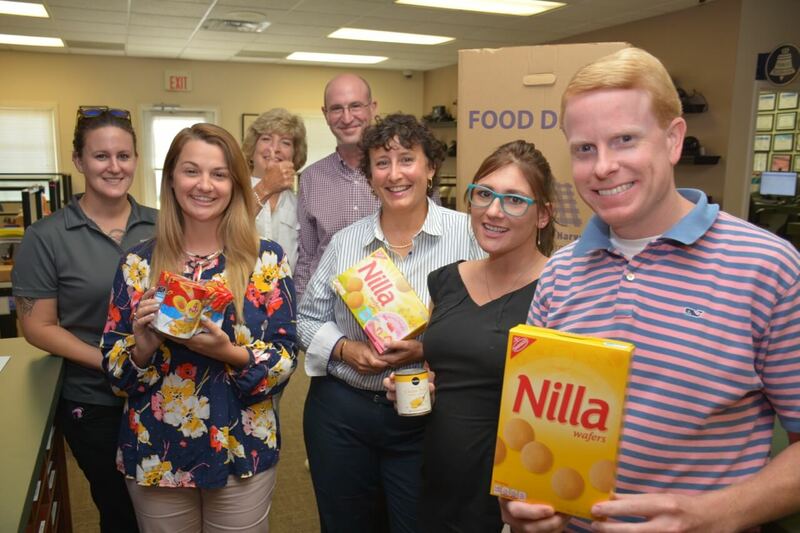 (SAVANNAH, GA) The Technology Association of Georgia has announced that Speros, a full-service technology company in Savannah, won Most Points Per Employee and Total Points for the Savannah area in the 3rd annual Bytes for Bites — a two-week fund and food drive competition benefitting Georgia food banks. Sponsored by the Georgia Food Bank Association, the goal of Bytes for Bites is to help children in food-insecure homes during the summertime when children no longer have access to free or reduced-cost school meals. According to their website, more than 1 in every 4 Georgia kids at risk for hunger. 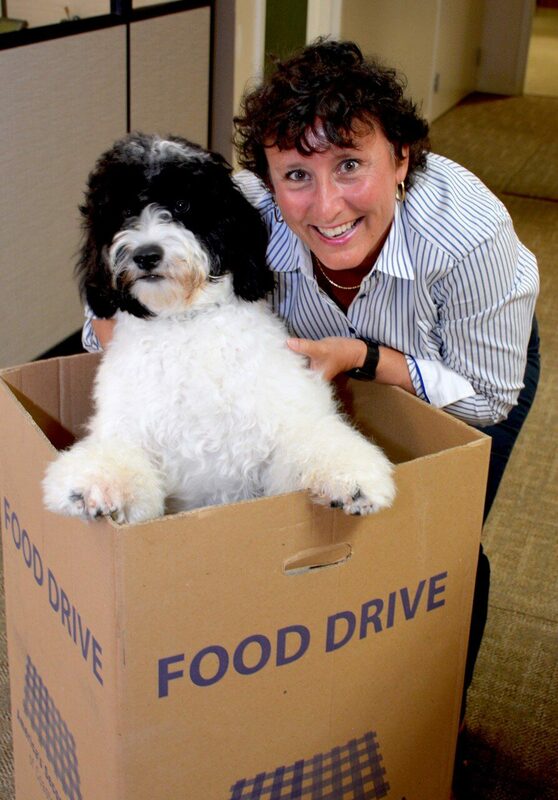 In total, the Georgia Food Bank Association reported nearly $70,000 raised and over 9,000 pounds of food collected in this year’s statewide competition, which is twice as much food as last year. For a full list of the 2018 winners, visit http://bytesforbites.org/awards/. (SAVANNAH, GA) The Southeast’s oldest floral and landscape nursery has gone high tech. 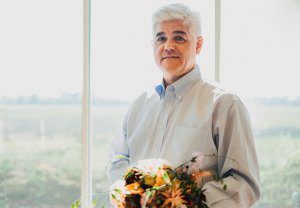 Founded in 1882, Savannah’s family-owned and -operated Oelschig Nursery, Inc., was recently outfitted for the 21st century by Speros, a full-service technology company in Savannah. The upgrade allows the business to maintain better client data as well as track and control inventory. The surveillance system ensures and monitors the safety of employees, inventory, trucks and other equipment on the grounds. The computer upgrade assures faster and more accurate vendor orders along with a speedier checkout process; the enhanced customer record technology also offers a history of past purchases plus recommendations for automatic reorders. As a wholesale-only horticulture business, Oelschig Nursery has served the floriculture needs of the coastal Southeast for over a century. Specializing in bedding plants for seasonal color and holiday crops for Easter and Christmas including Poinsettias, lilies, and Dutch bulbs, Oelschigs also has a family and employee honored tradition of supporting non-profit organizations in the Savannah, coastal Georgia, and South Carolina communities it serves. Established in 1984, Speros provides technology solutions for businesses, offering telephone systems, IT services, surveillance systems, web design and branding solutions and cloud computing. Speros team members continually stay updated on leading-edge, certified technologies to maximize solutions and ensure businesses succeed in this fast-paced, technology-driven world. For more information, visit www.speros.com, call 912-354-8900 or email info@speros.com. 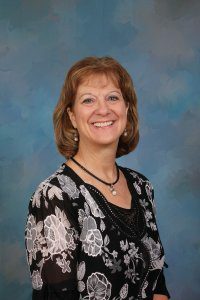 (SAVANNAH, GA) Susan Boatright, a credentialed educator and learning specialist is developing a student success program for Bethesda Academy that will include an individualized learning plan for each student, particularly those with recognized learning issues. Boatright is designing the Bethesda Learning Plan to focus on meeting the individual needs of students by providing academic, organizational and motivational support. The program includes benchmarks to monitor the progress of each student’s grades and academic status and to help them develop soft and executive skills. The Bethesda Learning Plan includes collaboration with Bethesda’s teachers to develop relevant assignments and tests and is structured to maintain consistent quality communication with teachers, parents and students. It also evaluates learning styles outside the classroom to create a well-rounded program designed to help each individual student succeed. Boatright, who had taught at Chatham Academy in Savannah since 2014, received a bachelor of science in education and a master of special education from Liberty University. 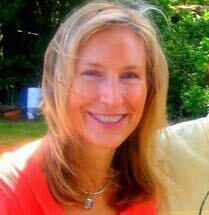 She left Chatham Academy to join the educational team at Bethesda for the 2018-19 school year. Social media is the 21st-century version of the backyard fence, allowing people to connect with each other, nurture personal relationships and express their opinions. It also has become a powerful tool for business owners to gain customers and foster visibility. While people might not mind when friends or family members rave about their perfect kids or rant about the political climate, they are less tolerant of companies that are overly self-promotional or express controversial opinions. When businesses make such social media blunders, the results can be impactful, ranging from lost followers to serious brand damage. Your customers want to be heard, and they often turn to social media to engage with you. Don’t you get annoyed when you’re trying to talk to someone and they are clearly not listening? The same is true for your followers if you provide no response or a blanket response. By focusing social media content on hard-sell promotions or product discounts, you’ll likely forfeit the opportunity to build relationships and you may even train your customers to shop with you only when they get a discount. Instead, consider adding content that provides value. Always balance your site with content your followers are likely to find engaging and encourage their interaction by providing links to helpful information or appealing offers. You should also avoid posting information that is too political or polarizing. That doesn’t mean ignoring your core values and beliefs, but you risk losing followers and upsetting audiences if your corporate social media posts take political stances for or against issues or political leaders. Every post should have a call-to-action, but if you’re simply offering a link to your homepage URL, you’re missing the opportunity to collect leads, increase sales and measure results. Instead, put a link to your purchase offer, downloadable resource or coupon. Send them directly to what they are looking for and you’ll see a significant increase in conversion rates. One of the biggest mistakes a brand can make is not staying true to its core message. Although a little controversy or edginess might be okay to keep your stream from becoming boring, be careful not to go too far. Don’t attempt to capitalize on trending topics by creating “viral” content that does not relate to the company brand or mission. Additionally, only use hashtags that are relevant and appropriate to your content, products/services and brand. Be realistic. Get started by focusing on the social media outlets that are a good fit for your business and invest in the long term with strategies to grow your impact. Set goals and objectives that you can use to measure impact. By identifying your goals, you can monitor and evaluate how well you use your social media channels to distribute content that fosters engagement. Your objectives should also include how the company will respond to comments, questions and backlash. Regularly monitor any negative feedback and respond authentically on a timely basis. Avoid creating costs or responses that might cause followers to “hide” your posts. Once they are gone, you will probably never see those followers again. Most of all, remember social media was created to nurture relationships. So use it for that purpose. Develop and build a loyal community that will be connected to and energized by your brand. 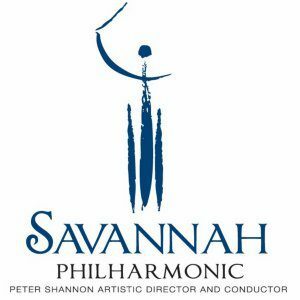 (SAVANNAH, GA) The Savannah Philharmonic announces a new presenting sponsor for Savannah’s largest outdoor cultural event, Picnic in the Park. 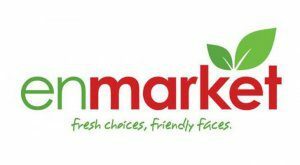 Enmarket is already a loyal supporter of the Philharmonic and this new partnership will ensure that the tenth-anniversary Picnic in the Park will be a truly remarkable highlight of the season. This year, Savannah’s annual tradition in historic Forsyth Park is slated for Sunday, Oct. 7, 2018, and around 20,000 people are expected to enjoy this year’s festivities, which are free and open to the public. development, production and fulfillment of Picnic in the Park in support of their mission. while family and friends watch-on. In addition, their long-standing partnership with 3 rd Infantry Division, provide performances by the U.S. Army Band, Color Guard and Salute Battalion. And traditionally, the Savannah Philharmonic Orchestra takes center stage at 7:00 pm! No, doubt, the 2018 event, which is free and open to the public, will once again provide great camaraderie and live music for all to enjoy. Savannah Philharmonic, please visit www.savannahphilharmonic.org.